Yeah! Who doesn’t love a good sale? We have one going on right now for Mother-In-Law’s Day! What? You didn’t know about Mother-In-Law’s Day? (It’s October 25th). Chances are– she doesn’t know about it either! Surprise her and grab a sentimental, handmade gift, and score some major points. With her– and your spouse. Enjoy 20% off on your entire order until October 11, 2009. Use coupon code MIL20 at checkout. Many of you order charms to celebrate a special occasion, to motivate yourself with a meaningful word or phrase, or to remember something important. Often, as we are making the charms, we wonder what they might mean, who they are going to, or what is the special meaning behind this one? Sometimes you share the meaning with us, and we love being apart of that significant moment in your life! We would love to hear more of your stories. We would love to hear who you gave them to, why you chose what you did, or what was the moment you were remembering. 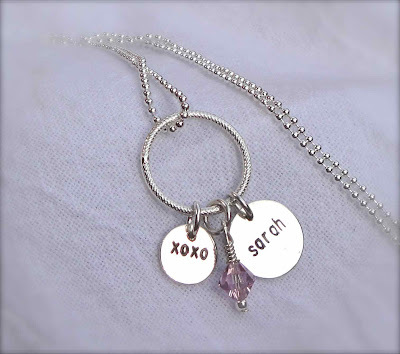 This month we are giving away a necklace with one charm to a customer who shares their story with us. We will post them here for you all to read~ and be inspired. Since there is never a “best” one, we will have a drawing at the end of the month, and pick a winner that way.